In the world of 3D printing it's not only the machines that keep evolving, materials evolve as well. 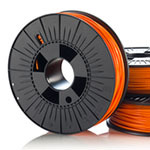 What follows is some brief information about the different filaments we sell and in which situation one filament might be preferable to another. We'd like to start off with saying that all the temperatures and settings mentioned here are just generic recommendations. Since there are so many variables involved in 3D printing it's difficult to give an exact "this it the best settings to use, period"-recommendation. Depending on how fast you print, how big or small your object is or if there are many small fine details etc you will have to tweak your settings to suit your needs. As you increase your print speed for example you need to raise your print temperature to compensate for the shorter amount of time the plastic stays in the hot zone. It should also be noted that the recommendations here are geared towards the Ultimaker2. This means that, for example, some temperatures listed might seem high compared to what you're used to if you're using a different type of printer. With that said, if you see something here that you strongly disagree with, something that is plain incorrect, or if you have useful tips to share we'd love to hear from you so that we can fix it. Use the contact form on this page and let us know, thanks! Since the Ultimaker2 allows you to set material specific settings on the printer itself it can be a good idea to create profiles for each material you want to use to make things more convenient. We have a little guide showing how to do that here and it also includes some important information regarding changing between materials with different printing temperatures. 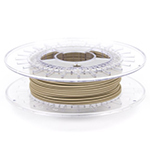 In our shop we have two kinds of PLA from Colorfabb, a regular PLA and a PLA/PHA blend. The translucent colours are PLA and the rest are the PLA/PHA variant. 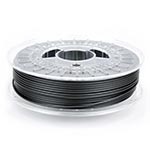 Both are a great general purpose filament that can be used for a variety of purposes. The PLA/PHA blend is slightly more flexible and thus less brittle than standard PLA and has a bit of a "soft touch". That's not to say that the material is soft, it's the feel of it in your hands. 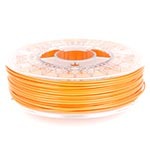 Like most PLA though it is not suitable for use in areas with high temperatures with its low glass transition temperature. The "glass transition temperature" is the temperature where the material transitions from a hard solid plastic to a softer state. So, for example, if you leave a PLA print in a car that reaches 60C during the summer there's a big risk that your print will deform. 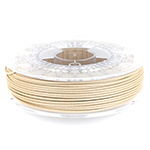 Similarly to ABS, PLA comes in a huge selection of colours, both opaque and transparent/semi-transparent versions. Unlike ABS it cannot be vapour polished with Acetone. There are chemicals that can do a similar job but we cannot recommend it as the chemicals are really nasty to work with. 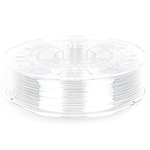 PLA can be polished using wet sand paper and hard work followed by polishing pastes. Keeping the print cool while sanding is essential as PLA is fairly temperature sensitive as previously mentioned. If you let the print get too hot while sanding it will go gummy and your hard work will be ruined. That said, we have used a power sander on PLA without issues. But we did use lots of water while doing so. Glueing PLA can be a bit tricky. CA glue ("super glue") seems to work fairly well though. An alternative to glue is to use what is called friction welding. Hold or clamp the parts to be joined together. Then attach a short piece of filament in the chuck of a high speed rotary tool (such as a Dremel), spin up the tool and then carefully press the spinning filament into the crack between the two parts. Friction will cause the plastic to start melting, move the filament in a small circular motion and move it along the seam to deposit plastic and "weld" the two parts together. This will create a strong, albeit ugly, bond between the parts. You may have to do several passes depending on the parts you're trying to join and how much space there is between them. After letting the parts cool down you can sand down the excess material to make the seam prettier. It's probably a good idea to practice this on some scrap pieces first to get a feel for the process. When sanding a print the surface of the print can become white(ish), rubbing the surface with some vegetable oil can help reduce this effect. Generally you don't need a higher bed temperature than 60C but if you're printing things with a very big bottom surface you might want to increase the temperature a bit to help keep the corners down. Also enable brim if you're having trouble with lifting. 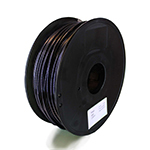 PLA filament that has been developed and tested by Ultimaker to work great in their printers. Unlike the PLA/PHA blend from Colorfabb, this filament is harder. Because it is harder it will be better able to stand up to prints that are retraction heavy. A softer material has a bigger chance of deforming when the same part of the filament gets run through the extruder over and over. This can then lead to grinding due to loss of grip and/or grinding because the increased diameter makes it harder to fit through the system. The tips from the Colorfabb section above is still applicable for Ultimaker PLA so rather than repeating the tips from that section you can read the parts concerning the pure PLA from Colorfabb above. TPU95A is a semi-flexible material that is very strong. It combines the best qualities of plastic and rubber and is excellent for applications with high wear and tear. Printing with this material is fairly straight forward. Normally using a brim is enough for bed adhesion but in some cases it can be beneficial to add a little bit of glue to prevent corners from lifting. Since it is a semi-flexible material retractions will be less effective and you might need to increase the distance slightly. 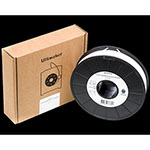 More information can be found on Ultimakers materials page. For the best results a heated bed is recommended when printing. Use a thin layer of glue stick and a bed temperature of around 70C. It is important that you use glue as it reduces the risk of chipping the glass plate. Without glue there's a chance that the plastic sticks so hard to the glass that small pieces of the glass can break off. You can print on a cold bed but you'll have to expect to see a bit of warp. Use blue painters tape (you should've gotten a roll with your printer) and make sure that your bed is nicely levelled. A level bed is of course always important but when trying to promote bed adhesion in order to minimize warping it's especially important that the first layer is as close to perfect as possible. In addition you will want to avoid using fans at all. If that's not possible for the entire print you should at least keep it off for the first couple of centimeters of the print. As always brim is also helpful to prevent warping. This is a great material to use when you need a print that remains stable in relatively high temperatures. It is also a lot stronger than PLA. Up until very recently XT only came in a transparent "colour" but Colorfabb just launched a whole range of new colours. Although the version that is clear looks like glass in its raw form you cannot expect your print to look clear as well. Due to the surface irregularities you get when printing, the light will refract a lot and make the print look fairly white. The closest to clear you will get is if you print single wall prints with thick layers. If you have access to a bigger nozzle that's even better as you can go up even higher in layer thickness. 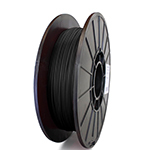 One of the newest materials from Colorfabb is this carbon fiber filled filament. This material is especially suitable when you need rigid prints. Prints with a matte surface finish. Since this material is based on the same Amphora 3D polymer from Eastman as the regular XT much of the same tips apply for this material so please take a look at the section for XT. Carbon fibre is quite abrasive and will accelerate the wear on your nozzle significantly. ColorFabb recommends to use nozzles from stainless steel or hardened copper alloys. FPE stands for Flexible Polyester and is a mixture of a rigid polymer and a soft polymer. The ratio of these defines how hard the material becomes, and here's where the 45D comes from. 45D is the shore hardness of this material and it can be compared to that of a sport shoe sole. This makes it suitable for products like phone cases or tires for robotics. Just like NinjaFlex this material prefers slightly thicker layers for best results. The manufacturer recommends the use of Kapton tape on the platform for adhesion but we've printed it successfully with just gluestick. You do need a high bed temperature to make the print stick properly. We do recommend a good amount of brim to help the print really get stuck on the bed. 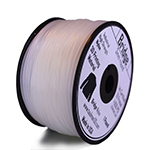 Due to the softness of the filament you might want to increase flow a bit. This is the softest and stretchiest material we have in our store and can be a bit tricky to print because of it. The material has a tendency to curl up and escape out of the standard feeder of the UM2. Some people have printed successfully with the standard feeder but we recommend that you use this replacement feeder instead to make it easier: https://www.youmagine.com/designs/alternative-um2-feeder-version-two Besides making it easier to print flexible materials you might like some of its other features as well. Due to how soft and rubbery this material is it can bend easily without breaking. Like all things printed with these types of printers the most likely place it will break is between layers. Unlike the other materials on this page we've written out a print speed here, a slow one at that. This is due to the "squishiness" of the material. If you go too fast the material will compress in the bowden tube and cause issues. Ideally you want the material to feed into the extruder at a constant rate so keep infill/perimeter speeds all the same. 30mm/s is probably about as fast as you'll be able to print with this material. Feel free to experiment and be aware that printing with this material is not easy. Some people like to add a small drop of oil to the filament to help reduce friction. If you try this it's probably a good idea to try and keep it away from the drive bolt so that it doesn't slip on the filament. Preventing stringing is tricky with this material and the bowden tube setup. Retractions do work, kind of, but they're not super effective. In testing it seems that rather than increasing the retraction distance and speed it is more effective to go up in layer thickness to 0.2mm. 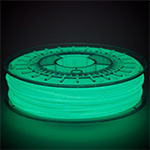 This material does pretty much what you'd expect, it glows! Remember those glow in the dark toys you had as a kid? Now you can make your own. In daylight this material is a white creamy colour but with the lights out it has that classic green glow. For maximum glow you should print the piece solid and let it charge up under a high powered light, or even better, in the sun. This material prints just like our standard PLA/PHA from Colorfabb, the only difference is that instead of say, a red pigment, a GITD (Glow in the dark) pigment is used instead. If you are using the alternative feeder by I Robert I we recommend that you don't use the snap on guide. The surface finish of this filament is somewhat coarse and can cause unnecessary friction. The snap on guide is really only needed for very soft materials so there shouldn't be a problem. ABS is good when you need a print that has a bit more give than PLA and is more heat resistant. A very simplified way to look at it is that PLA is a very hard plastic that tends to snap when it breaks and ABS is a bit softer and tends to bend before breaking. It also has a higher glass transition temperature than PLA which means it it more suitable for hot situations like the inside of a car during summer. On the downside it can be a bit trickier to print as it tends to shrink more than PLA and it also has a nastier smell while printing. For bed adhesion we've found that a fairly thick layer of the glue stick supplied with the Ultimaker2 works OK. 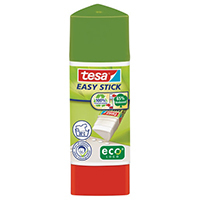 But we prefer a different kind of glue stick called Tesa Easy Stick. We use this for both PLA and ABS prints and it works very well. For ABS you'll want to use a good amount of glue, put it on in two layers, one layer perpendicular to the other. This glue stick comes in both a round and a triangular variety, we prefer the latter. The picture on the left shows the gluestick we recommend. If you need your parts to stick even better you can read the section about Acetone slurry below. This section talks about the use of Acetone which is a chemical that should be handled with proper care and respect. It is extremely flammable and it is not something you want to breathe. Work in a well ventilated area and try not to get it on your hands if possible. For glueing ABS parts you can create a make shift glue by dissolving pieces of ABS into Acetone and then using the resulting slurry as a glue. A similar slurry can be used to spread on the print bed to aid with bed adhesion if you need parts to stick even better than the glue stick. To create the slurry you simply dissolve about 1/3 ABS into 2/3 Acetone in an air tight container. To speed up the process it is helpful to grind up the plastic into smaller parts. Once all the plastic has dissolved the resulting slurry can be used as a glue that will chemically bond two prints together. Apply the slurry to the parts and then press them together. The Acetone in the mix will melt the surface of the prints and as the Acetone evaporates you are left with a very strong bond. For post processing your print there is a neat trick you can do with Acetone to get rid of the print lines on the surface of the print. By subjecting the print to Acetone vapour the surface melts slightly and becomes shiny. What you do is heat a small amount of Acetone in a suitable container such as a large glass jar, as the Acetone evaporates it will fill the jar with vapour. Some people have used the heated bed of a printer for this (but remember, Acetone vapor might affect parts of the printer as well so be very careful). Create something to hold your printed piece, like a bent piece of wire for example, and carefully lower the piece into the vapor. Hold it there until you're happy with the look and then remove it. The surface of the part will be soft and fragile and you need to let it sit undisturbed until it hardens back up. You may need to adjust the filament diameter setting for this material. It's best that you try to print something and see if it's needed. Usually you need to use a smaller diameter than the default 2.85mm. The name "bridge" comes from how this filament "bridges the gap" between the strength of nylon and the ease of printing with ABS/PLA. This is a very strong and flexible material that can take a fair bit of abuse. In fact we have a test print that we've been bringing to events and let people try to rip apart, so far they haven't been able to. Compared to other nylon materials it has reduced moisture absorption, reduced shrinkage and better bed adhesion. 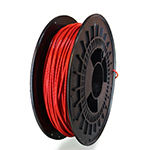 Nylon is the strongest type of material that printers in the Ultimaker class can currently use. Rather than cracking it will flex and bend. Thin parts are very flexible and can be useful for creating things that need to flex regularly during use such as straps or buckles. If you need a part that has low friction, Nylon is again a great choice. While this nylon only comes in a single colour (an off white(ish) semi transparent colour) you can still get colourful prints by dyeing them. You can use fabric dyes suitable for nylon, Rit is one brand that has been shown to work. Check the packet or with the manufacturer to see if the dye you're planning to use is suitable for nylon or not. The dyeing process is fairly straight forward; dissolve the dye in boiling water, bring your print/filament up to temperature by dipping it in boiling water for a couple of minutes before submerging it in the dye. Leave it in there for 30 minutes or so. Rinse in hot water first and then in cold water. After you've dyed your raw filament or printed object (Taulman recommends dyeing the printed object rather than the raw material) you need to dry it. Some people like to dry filament in an oven, others like keeping it in a air tight container with desiccant. That choice is up to you. You might need to increase flow a little with this material as it doesn't have much die swell (expansion after exiting the nozzle) compared to standard PLA. 4-8% is recommended by Colorfabb but feel free to experiment. Even though this material has a high metal content, that doesn't mean it is strong like metal. In fact it can be quite brittle and should therefore be used for cosmetic pieces rather than structural pieces. The material is a mix of PLA and bronze particles and can be polished up to bring out the metallic look of the bronze. Like you would for most sanding jobs you should start with a coarse sand paper and work your way towards finer and finer grits until you reach the surface quality you're looking for. Even though your print may be smooth to the touch after the sanding steps the metal particles will still need to be polished to bring out their shine. This can be accomplished with steel whool or a rotating wire brush for example. From here you can use polishing compounds (copper polish, Autosol etc) to bring out even more shine. To finish things off you can use products that add patina to metal pieces. Or you could use an oil paint wash to bring out more detail by brushing it on and quickly whiping most of it away again. An important note for this material is that it's very important that you do not let it sit still in the nozzle while heated up. Doing so will make the material degrade and clog the nozzle. Luckily the start up routine on the Ultimaker 2 waits until the bed has heated up before heating the nozzle and then starts printing immediately as the print head has reached the correct temperature. You should still keep this in mind though in case you for some reason might leave the print head heated up without printing (such as performing a mid print pause for example). WoodFill is a mixture of roughly 70% Colorfabb PLA and 30% wood fibre which create prints with a wood like feel and texture. This material seems to be happier with thicker layer heights of about 0.25mm. With a 0.4mm nozzle you probably shouldn't go any thicker than 0.3mm but if you have access to a larger nozzle you could go even higher for a rougher appearance. At the moment there are no larger nozzles available for the UM2. This is an interesting material that produces prints with a kind of ceramic feel. It is a thermoplastic with a fill of fine chalk powder. Depending on your print temperature the surface quality changes. At low temperatures, which must be combined with a slow print speed to prevent under extrusion, produces a smooth finish. By increasing the temperature the surface quality changes and becomes more coarse. A slower print speed in general is recommended. This material is ideal if you're creating architectural models and want to give them more of a "real world" feel. If you are not happy with the surface quality this material can easily be smoothed out with wet sand paper. For an excellent write up on this material you should check this link out:. It is also important to point out that this material is quite brittle and should be handled with care.